Continual sporadic showers and a dramatic temperature plunge last Saturday did little to deter our market browsing intentions. We headed to the Farmers Markets at the Entertainment Quarter, the enormous white canopies offering welcome shelter from the unobliging weather. 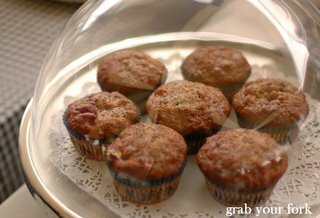 The cupcakes and muffins loked cute, but with our bellies grumbling at 11am we were more interested in the prospect of a nourishing tasty breakfast. 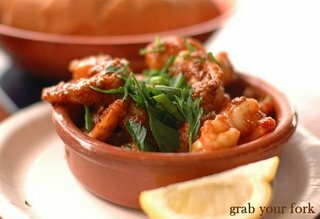 A had the garlic prawns, cooked fresh on the grill with Mojo Picon's garlic tomato sauce. Veruca Salt and I, however, only had eyes for the thick fingers of juicy chorizo, seared on the grill to produce patches of caramel brown along its skin, and jammed into a crusty roll and smothered in Mojo Picon sauces. Now that we'd had our savouries, we could then move onto dessert. 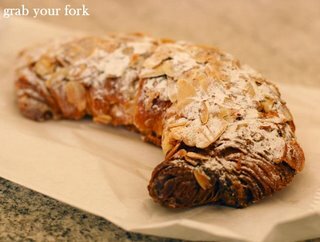 I waxed lyrical about the almond crossiant from Beb Patisserie so much that not only did I convince Veruca to buy one, but somehow I really needed one as well. 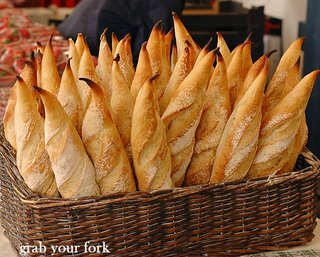 It's a crisp flaky crossiant with a rich pastry that tastes of almond meal. 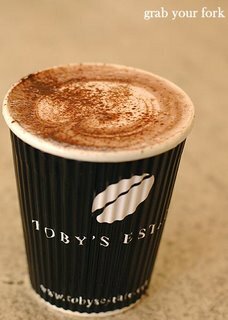 And to wash it down we couldn't resist a steaming hot chocolate from Toby's Estate. One stall was selling fresh jackfruit much to the intrigue of passing shoppers. The jackfruit was a little unripe and firm for my liking, but then perhaps they thought its lighter flavour would be more appealing to the uninitiated. One of my favourite snacks. Parking is free for the first 2 hours up until 6:00pm. hmm i concur the chorizo looks mighty appetizing but i have a very large sweet tooth myself so probably raid the sweets first! Mojo Picon were at the (very unfortunately rained out) Chatswood Spring Fair on Saturday. 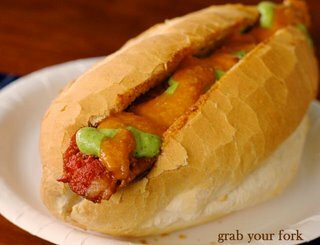 their chorizo rolls are so good - i'd never tried them till then! i had everyone at work looking enviously at my lunch... so much better than the usual fare! OMG, jackfruit! Yeah, it looks a little pale in the picture but...fresh jackfruit!!! Do you know where I can get them from on a normal weekend? Hi Helen, Does Beb Patisserie have a shopfront? The macaroons look to die for! oh btw.. was wondering if you know where i can get good home made jam or just special jam like mango jam? 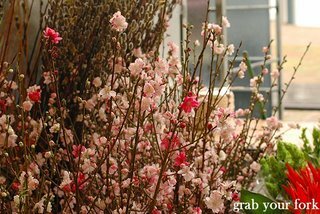 ?i need to get it before the 29th of this month.. i was gona go to the good living growers market but missed it.. ><" am very desperate.. The almond crossiant was beyond words. I regret sharing it with A. Must get me to Beb on the triple! I'm still a little undecided about Chorizo, in my experience it's always been a bit too fatty or salty (maybe I've just tried bad places). 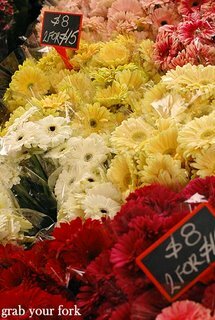 But i'm very into fresh flowers & markets at the moment so I'll probably be making a visit soon. 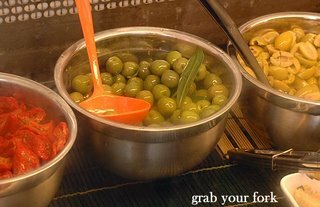 BTW - I was very disappointed with the green silician olives. For $8, I expected something with more bite. Lovely and colourful pictures! Everything looks so appetizing. I never have seen or tasted jackfruit, do you eat it raw? Chrizo roll sounds delish,i haven't been to the Entertainment Quarter markets in years,is it much bigger now? Hi FFichiban - Ahh yes, we spotted the giant Cirque-branded tent as we approached. The chorizo was good. A perfect savoury base for sweets later on. Hi Shez - I noticed that the Chatswood Spring Fair was on and empathised with the organisers. The Mojo Picon chorizo is nice and juicy - I just wish they had some chilli in them to add some kick. Hi kat o+ - Jackfruit is popular with Asians so I'd head to Cabramatta and Bankstown for your best bet. I think it's only occasionally available at Paddy's Markets in Chinatown. Hi Ben - Beb do have a regular shop which I have posted on before. Thanks for reminding me to add some links which I've now done so as above (and yes their macarons are pretty good). Hi joey - I like ripe jackfruit which becomes supersweet, plump and almost pulpy. re: homemade jams - you could always try the other farmers markets which are on, like Orange Grove (the Farmers Wife jams are yum) or Ashfield. Otherwise head to DJs Food Hall or the Essential Ingredient. 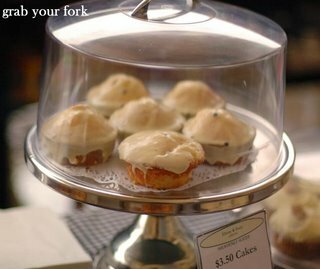 Hi Veruca Salt - They bake all their breads onsite on stones, and they have a tantalising display of gateaux, tarts and pastries. Hi Pickles - Oh you cannot beat good chorizo. Sure it's fatty, but that's like garlic prawns are fatty. It's where the goodness and flavour is! Hi jenjen - Yup I've bought the salsa verde sauce before (the red one). I was somewhat guilty of constantly topping up my roll with more sauce with each bite. Hi Veruca (again) - The olives were disappointing. Next time we will have to try before we buy. Hi myy - Yes jackfruit is eaten raw. It's a tropical fruit so it's very fragrant, vividly coloured and fairly fragile when ripe. Its flavour is hard to describe but perhaps a cross between mango and pineapple? 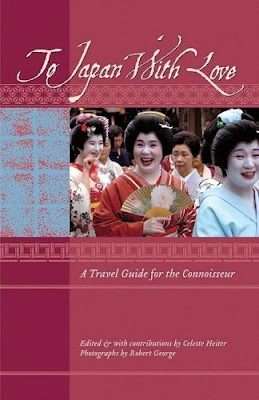 It's often available in tins from Asian groceries. Hopefully you'll be able to track some down to try. 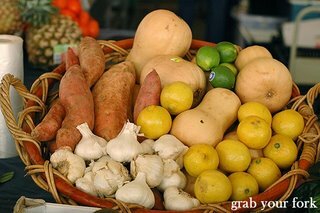 Hi Ellie - I love farmers markets. Everything always looks so fresh, natural and tasty. Hi MissK - I think it has expanded. I've only really been a regular markets person in the past couple of years. It's a nice morning out, and parking is free and easy too. 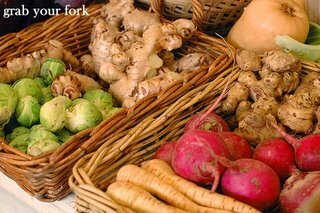 Hello to Grab Your Fork from Rosmead Farm Produce! I've read comments and have tried to answer all questions below. Blog again if I miss the mark. Thanks for your picture and comments. Youre ar 100% correct in that we are selling a little under ripe to initiate the 'western palate'. 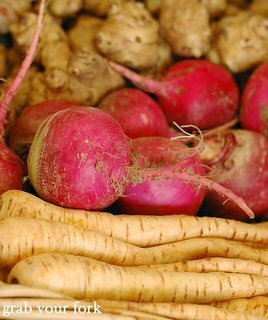 The good news is that to buy a segment and leave it in the fridge for a couple of days will give you that richer flavour you no doubt are accustomed. We are down at the Ent qtr ongoing so come and find us. 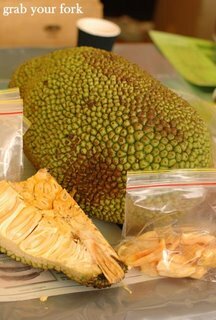 Fresh JackFruit will be available all throughout the year. Our sources are well protected (they come from our farms in Northern Territory!). Standing orders are welcome. Best come on down to the Ent Qtr to try it fresh. We will be offering samples ongoing. I am also compiling a 'drivers manual' so you can exploit the full value of your Jackfruit (the roasted Jackfruit seeds are to die for!). Its a surprising versatile fruit, hence its popularity it the greater asias. 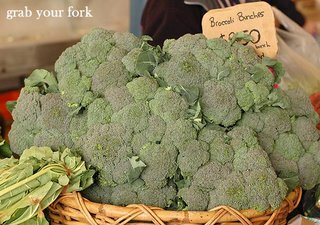 Hi Keith - Welcome to GrabYourFork and thanks for taking the time to comment! I didn't realise that jackfruit "ripen" in flavours in the fridge after you've opened them--thanks for the tip. And roasted jackfruit seeds? Sounds very intriguing. We'll have to check those out next time we're over there. 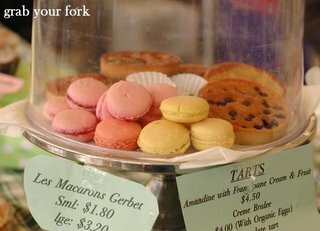 GRAB YOUR FORK is Helen's gastronomic journey around Sydney and the world. 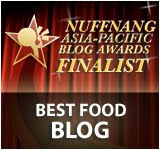 She is a freelance food writer with a love of cheap eats, offal and fried chicken. 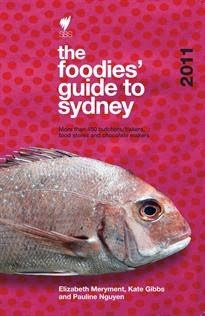 Her work has been published in Good Food and Time Out Sydney. 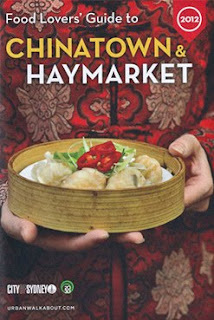 She was Cheap Eats editor for 2012 Eating and Drinking Sydney and has contributed to The Foodies' Guide to Sydney, the Food Lovers Guide to Chinatown and Voracious: The Best New Australian Food Writing. Read more about Helen or send an email. > Bloggers vs Critics - Can anybody write a blog? 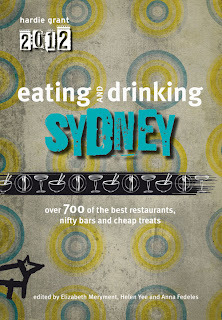 Darling Harbour, Darling Square and Pyrmont..
All Sydney restaurants by cuisine..
Sydney festivals and outdoor events..